The physical facilities of PRCLS include two buildings located in the cities of Picayune and Poplarville. 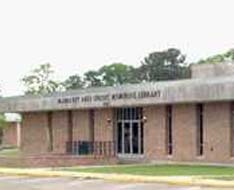 The Margaret Reed Crosby Memorial Library and Cultural Center in Picayune, MS was built in 1963 and opened in February of 1964. This building and its furnishings were provided by the Crosby Family in honor of their grandmother, Mrs. L.O. Crosby, sr. The original building of 11,000 sq. ft. was renovated in 1983-84 and enlarged to 13,000 sq. ft. It serves as the headquarters of the Pearl River County Library System.